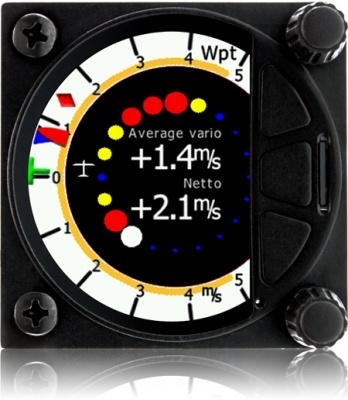 Standard ø57mm all glass Variometer with extremely powerful processor • Using MEMS inertial platform and pressure sensors • built in AHRS • 3.5” (S80) of 2.5" (S8) high brightness screen (320x240 pixels) sunshine readable • Fast wind calculation 50 times per second. Built in Flarm display, navigation, airspace, “go to” waypoint and task planning. GPS or Flarm input and PDA/Oudie power and data output. (AHRS enabled though additional firmware).